There has been more balance between supply and demand in the summer and fall. A good metric to measure supply and demand is days on market. Lower market times indicate high demand and low supply. Higher market times indicate low demand and high supply. In this issue we charted days on market for each month of 2015 to date. 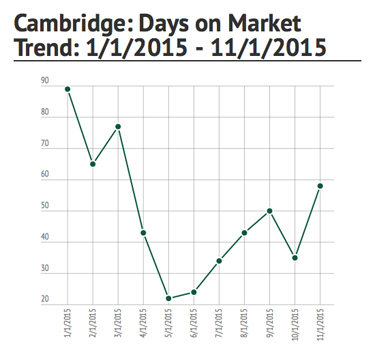 Days on market for Cambridge was the highest on January 1 at 89 days. As spring arrived days on market fell dramatically reaching a low of 22 days on May 1. Days on market increased through the summer peaking at 50 days on September 1. After decreasing to 35 days days on market increased to 58 days on November 1. The record sale prices in the spring are leading sellers to over price listings. This is a major factor that is increasing days on market. 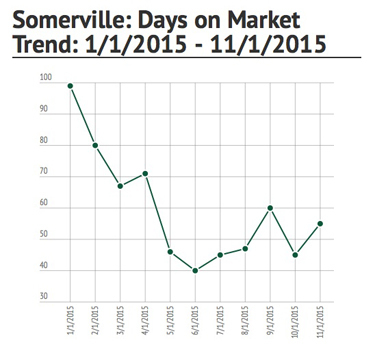 The days on market trend for Somerville tracked the Cambridge days on market trend. As in Cambridge DOM was highest on January 1 at 99 days. As spring arrived days on market fell reaching a low of 40 days on June 1. Days on market increased through the summer peaking at 60 days on September 1. After decreasing to 45 days days on market increased to 55 days on November 1.